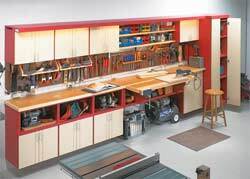 Organize your shop or garage with these free woodworking plans. Build shelves, storage units, and containers to store your tools and hardware. Customize these plans to suit your needs. 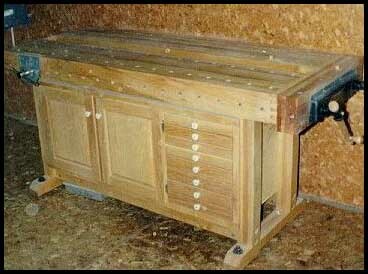 13 Free Woodworking Plans found in the "Garage / Shop Organization" Category. Inexpensive Shop Storage Mounted To A Finished Wall. Turn your disorganized sanding supplies into a woodworkers dream. 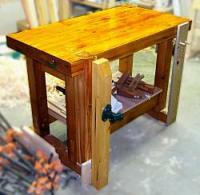 This free woodworking plan will help you organize your shop. It is cheap and sturdy because it is built from 2x4's. This doesn't mean that it has to look cheap. When building this workbench, try to select only the finest 2x4's and use a good polyurethane to finish it off. 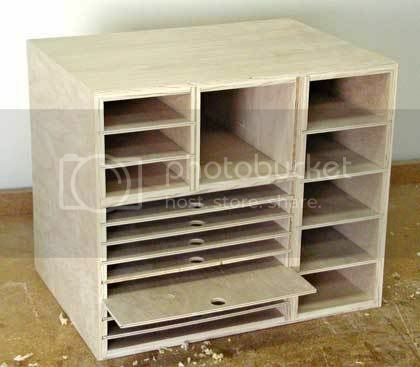 This free woodworking plan doesn't have any drawings or cut lists, but it sure is a great story. You might even be able to build this bench simple based upon the narative. Nice work. Check this plan out for more pictures of the workbench. Simple to build, mobile and packed with storage, this toolbox stores your tools and keeps the ones you're usin at the ready.